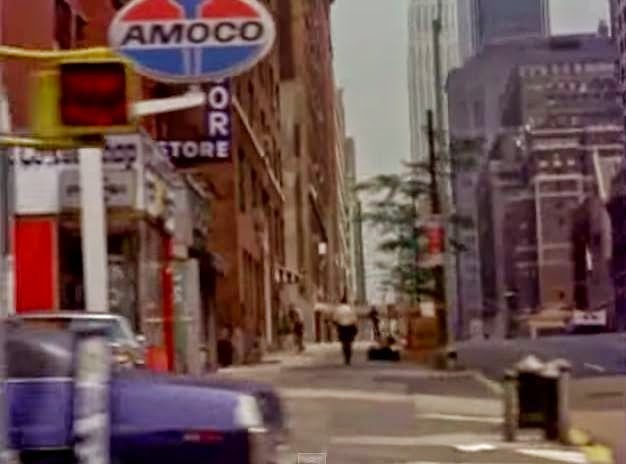 There's no better place than Manhattan Before 1990 for a mysterious location of a photo to be solved. 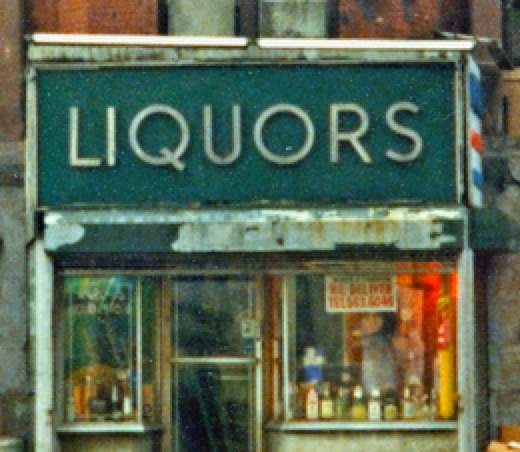 The detective work is beyond anything a museum or library would do in New York City. There might be stellar geo-sleuths out there but collectively this group is unrivaled. 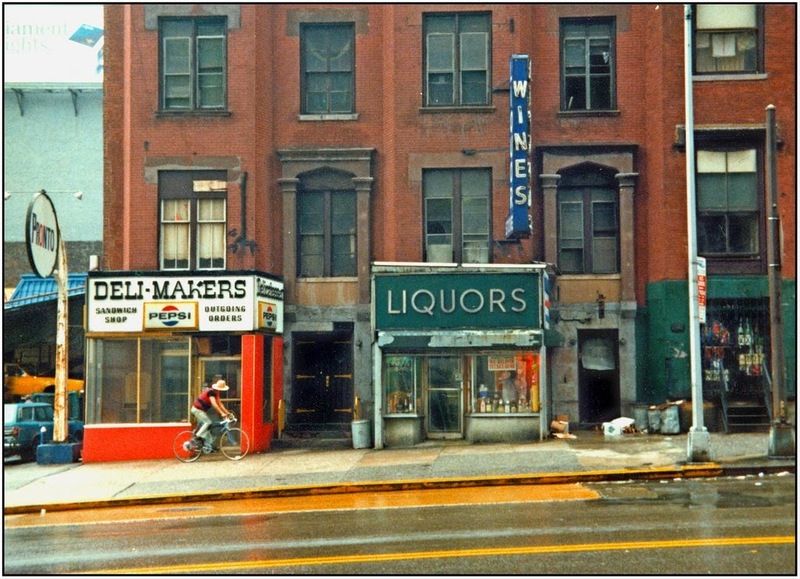 The mysterious location of this 1979 photo (above) by M. Joedicke took among the longest to find. The photographer didn't even know where it was. There's a Pronto gas station sign but let's just say Pronto came and went and nobody remembered it having even arrived in New York City. That brings out the next obvious clue. 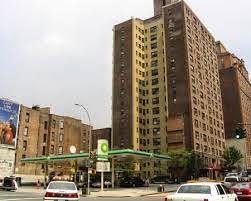 This is a two-way street and it had an uncommon slope which also led the search towards Inwood, The Bronx and Harlem. That was far too wide of a search perimeter to find anything fast. So another investigative approach was deployed. Another clue is the road is wet. A member then looked at all the rainy day photos in the original album. He immediately found rainy photos on 34th Steet (this would later prove to be the correct street). 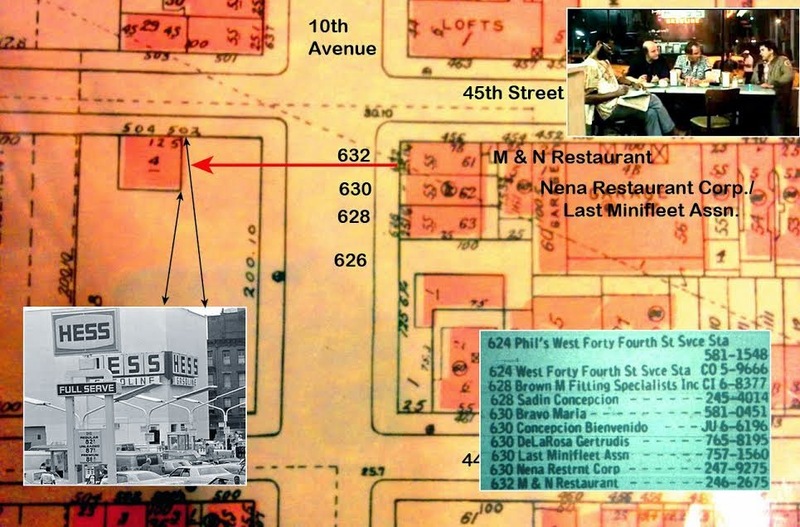 But the photographer traveled to both East 34th St in Kips Bay and to West 34th St by New Yorker Hotel. He stayed at Hotel Mansfield on 44th St near 5th Ave and had also photographed 42nd Street all the way across. 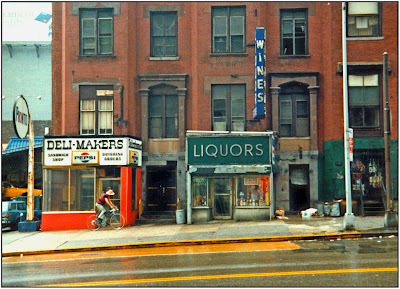 But that narrowed it down to only two, 2-way streets he photographed on a rainy day. Additionally, 34th St and 42nd St only sloped closer to the rivers. 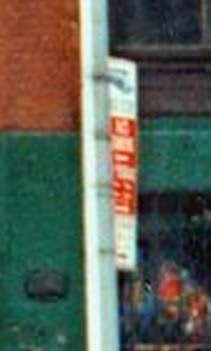 The member suggested 1979 gas stations could be skinny and noted how small the Pronto sign was. There was also a speculative guess by another member that a blurry address above one door was in the 400s. This site was 461 W 34th St.
All the circumstantial evidence fit...spot for taxis to fuel up, former gas station was here, two-way street, empty lot (open to possibilities), bus route, 563 exchange area, and a two-way street the photographer photographed on a rainy day (1 of only 2 two-way streets he photographed that day). The bet was the photographer (from another country) had to have taken another photo during his stay nearby this photo. But still there were no firm believers of this spot being correct. 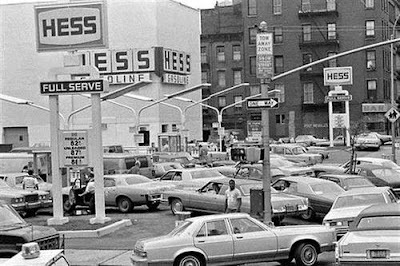 Later, a former taxi driver and notable photographer almost put it to rest by saying he had pumped gas here into his cab and it cannot be the spot. 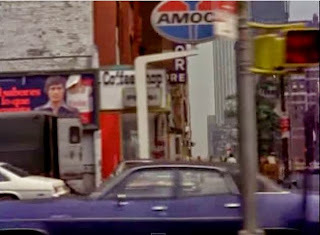 Then David Cohen revived the theory this could be 10th Ave and 34th St facing north...6 days later! There is a billboard which meant this had to have been a vacant lot, parking lot or gas station for a long time. 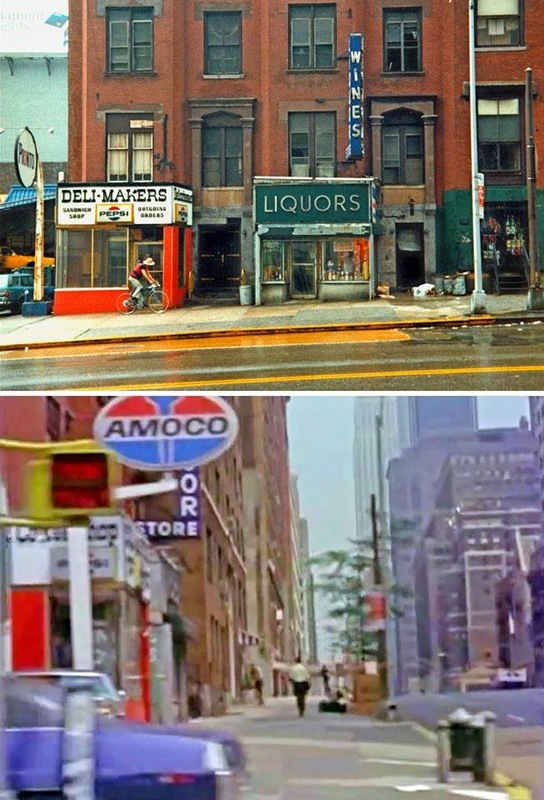 The video footage is a beautiful document of 10th Avenue from 30th St to 46th St. That led to another connection. For the longest time, quite a few Taxi Driver (1976) geo-sleuths were wondering where the diner across from HESS was with Robert De Niro (r). 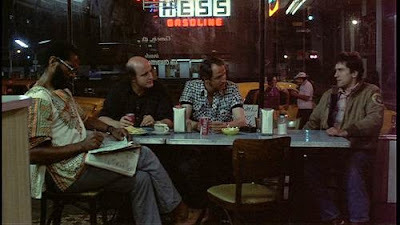 The ceiling light, door position and neon sign seemed to put it in the right ballpark for the Taxi Driver (1976) diner across from HESS. Bob Egan of PopSpots immediately replied. Geo-sleuthing takes a lot of patience to wait for the clues to arrive and geo-artifacts to manifest. 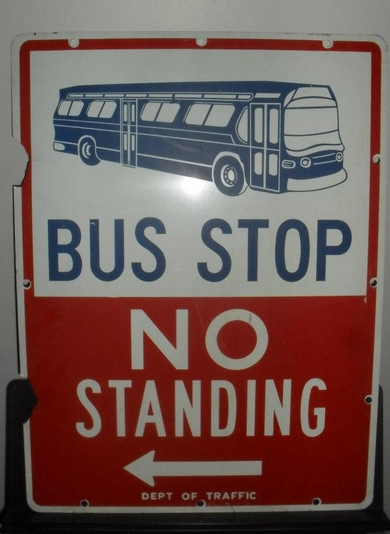 It also requires one to hold on to a circumstantial theory when others think it is wrong. There are many times a theory is wrong. Without the smoking gun, it could be wrong. It's never fully solved until you have visual confirmation. UPDATE - The yellow circle should be over the bar on the left in the Taxi Driver scene and the green square should be over the H in HESS. 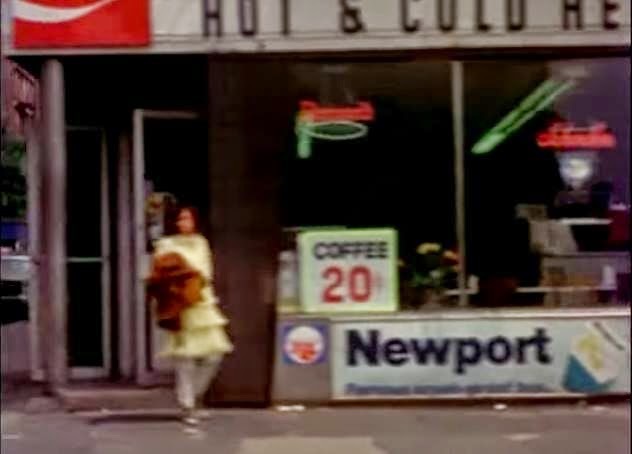 UPDATE: The DJ Mix video footage is originally from Chantal Ackerman's documentary News From Home (1977). Oh that´s great! 36 years later. 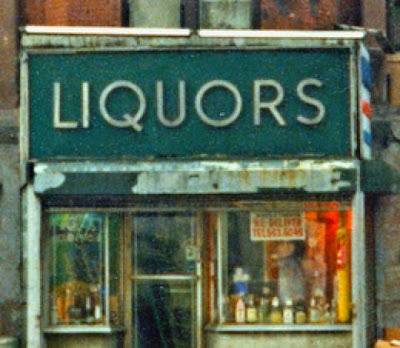 The place of my NYC walk rediscovered. Congratulations! In other news, the Hess Station has been rebranded as a Speedy's Gas Station as of a few days ago! Saint Michaels is still there and Mass is Celebrated daily by the wonderful Fr. George Rutler.